Once Jacob Gutgeld lived with his family in a beautiful house in Warsaw, Poland. He went to school and played hide-and-seek in the woods with his friends. But everything changed the day the Nazi soldiers invaded in 1939. Suddenly it wasn’t safe to be Jewish anymore. One afternoon, eight-year-old Jacob slipped through a hole in the ghetto wall to meet Alex Roslan, a kind Christian man who agreed to be his new “uncle.” The Roslan family, at the risk of their own lives, kept Jacob’s identity as a Jew hidden. Every day of hiding meant a new danger and a threat of discovery. 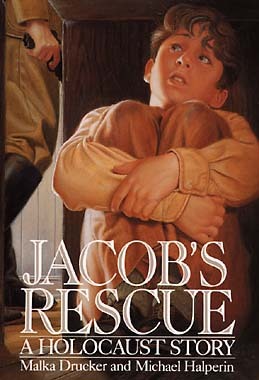 Jacob worried about his real family and longed to go to school and play outside like the Roslan children. The fear, the hunger, and the hardships brought Jacob closer to the Roslan family until at last they were able to begin a new chapter in their lives.